There are many reasons why pedestrian walkways may need to be installed at a site. It could be that an access path is required at the roadside for staff carrying out work on stretches of motorway, or a footpath linking the showground to the car park at an equine event. Each situation and environment demands a different ground protection solution, dependent on time constraints and whether the solution is to be temporary or permanent. 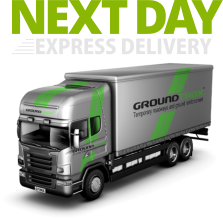 At Groundtrax we have a range of ground reinforcement products that are designed to meet every pedestrian walkway requirement. CellPave™ AP from Groundtrax is a ‘no-dig’ anchored ground reinforcement paving tile. 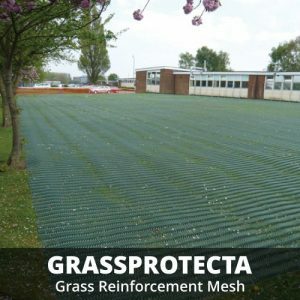 It is installed quickly and easily and it provides a cost-effective way of reinforcing existing grassed areas without the need for a sub-base. It is used extensively for car parking and to reinforce grassed areas for walkways and other pedestrian areas. The grids are a much stronger alternative to roll out meshes that are pinned into place as the grids themselves are vibrated into the ground with a vibratory roller. 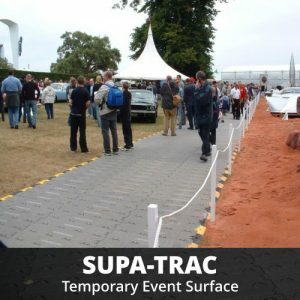 Supa-Trac™ temporary surface is suitable for medium or heavy weight use and protects the ground underneath as well as protecting vehicles or people from the ground. The Supa-Trac™ panels are quick and easy to install with up to 70 m2 laid per hour and no tools are required. The temporary flooring panels can be laid on any ground covering and can be fitted to any shape – it’s the simplest, fastest ground cover solution of its type on the market. No tools or expertise needed. Additionally, the flooring panels are easy to remove and can be stacked and stored easily. If required, the panels can be cleaned by hosing them down. Supa-Trac™ LITE is the ultimate pedestrian flooring. It conforms to almost all ground types and conditions, and can be laid over whatever area or shape you need. With super quick installation and extraction – up to 70m² per man hour – it’s the simplest, fastest ground cover solution of its type on the market. No clips, tools or expertise needed. 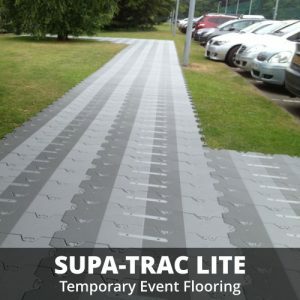 Super tough, Supa-Trac LITE is suitable for temporary flooring for exhibitions, access routes, pathways and edging ramps are available to eliminate trip hazards. Store it inside or out for years of flexible use; whenever, wherever. It comes in a range of colours and, as with all Supa-Trac products, meets anti-slip regulations. 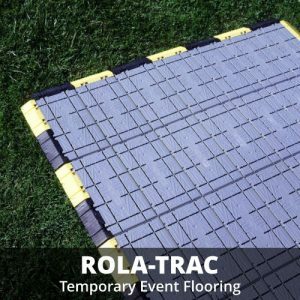 Rola-Trac™ ULTRA is a click together system of panels, which can be fitted on any surface and to any shape, creating a firm, non slip surface for commercial, professional and domestic use. The flexibility and variety of uses make it one of the most adaptable flooring systems available. It can be used for both indoor and outdoor events where a solid non-skid surface is required and the existing surface must be protected. Grass is protected from being trampled and dirt areas are covered. Rola-Trac™ ULTRA is very fast and easy to install, as no tools or expertise are required and panels are supplied in pre-assembled panels. It can be used in all weather conditions as it is molded with high-impact polypropylene with UV inhibitors preventing damage from long UV exposure. Where time is of the essence and a walkway is required in a hurry, CellPave AP anchored ground reinforcement tiles offer quick and easy installation. The tiles can be installed on soil or grassed areas with or without sub-base and have special openings which serve to provide effective drainage. 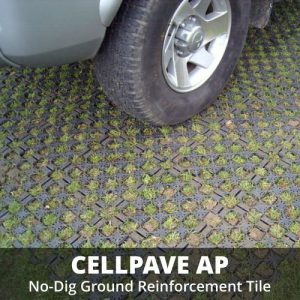 CellPave AP can be used as a temporary walkway or as a permanent solution; with grass intertwining with the reinforcement tile the longer it is in situ. For an optimum solution to temporary pedestrian walkways, Supa-Trac and Supa-Trac Lite can be used. The temporary flooring panels can be laid on any ground covering and can be fitted to any shape. If ground is well drained but the grass surface requires some protection, GrassProtecta is a great option for footpaths and walkways. This cost effective ground reinforcement mesh can be laid quickly and will not usually require any excavation or soil removal. The green mesh blends with the grass sward over time, to provide a discreet pedestrian footpath that offers superb slip resistance. Where the ground is naturally quite wet and a sub-base is required, CellPave 40 or BodPave 85 heavy-duty porous plastic pavers can be utilised. 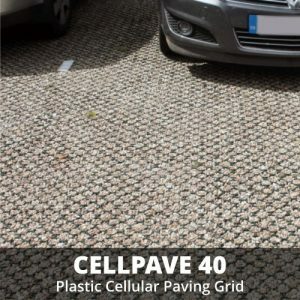 The cellular paving can be filled with gravel or topsoil and grass seed for the desired aesthetic; offering a permanent footpath that can handle high levels of pedestrian traffic.